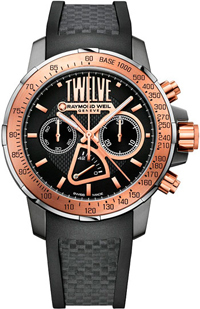 The magic number 12 on the clock Nabucco Cuore Caldo Twelve by Raymond Weil. Each model of the famous watch brand Raymond Weil is original in its own way. Exclusive new product recalls that every minute counts, and changes are in our power. Raymond Weil company makes its contribution to the future with new products: part of the income from sales of watches Nabucco Cuore Caldo Twelve will be donated to the developments in the treatment of children who have cancer. For years, Raymond Weil watch brand has been involved in the fight against cancer. With the support of the new items she resumes onco-hematology department of pediatric clinic of the University of Geneva in Switzerland. Models from the line nabucco characterized smoothed forms and structural design as well as the underlined number 12. Usually, this number was written on the face of Roman or Arabic numerals, however, the new product for the first time, it was not written in figures and letters, and the importance of emphasizing the magic number. Gorgeous watch Nabucco Cuore Caldo Twelve combine cold steel shine, lightness of titanium, carbon fiber strength, the warm glow of 18 karat rose gold. Bezel made of gold, has black numbers. The 46 mm round case is a black dial with gold hour-markers and gold arrows to indicate the hours, minutes, seconds, and also to indicate the second time zone. Time gives the original look of the figure 12, to form the letters – TWELVE. 30-minute and 60-second counters are located at the labels 3 and 9, and in the “6:00” is a power reserve indicator. The back cover is made of titanium and sapphire glass, allows the monitoring of the work of the caliber, decorated in the style of «Cotes de Geneve». New product complements Nabucco Cuore Caldo Twelve black vulcanized rubber strap. The introduction of the limited 76 copies. You can buy a watch in a special box with a set of cuff links and pens.